I used American Apparel Hassid as a base, with China Glaze Millennium for the silver chains, and China Glaze 2030 for the gold. :) Topped it all off with 2 coats of Seche Vite top coat, because I wouldn't want the chains to break, right?! OMG! Love this! 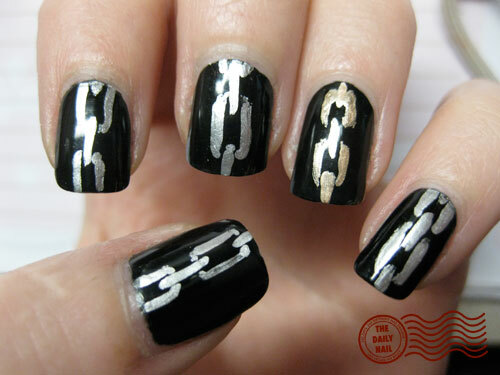 I think this might just be the first nail art *I* might be able to do. Anyway, loving the simplicity of it on you. I look forward to seeing your nail of the day each day. This is just another amazing one! Great job! Oooh, next time I get to go to a rock or metal night, I'm gonna do this! This is one of my fave blogs. So creative! how do you keep your nails that length? I mean like how do you care for your nails themselves and keep them square? I find it very interesting since I have very weak nails. Lucky you !